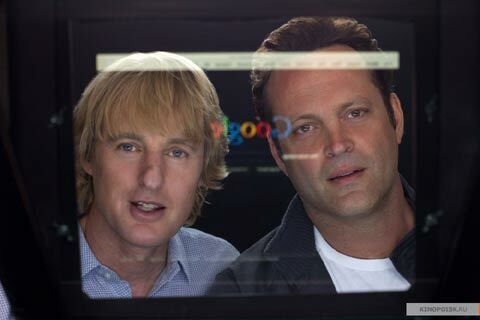 It was eight years ago that Vince Vaughn and Owen Wilson became kings of the comedy world. After an unusual start at the box office, opening up behind Tim Burton's Charlie and the Chocolate Factory, the film absolutely exploded and earned over $209 million during its run.In the months and years that followed there were a number of rumors that said the two would be pairing up again to star in another big comedy, but as time passed it began to look less and less likely. And then director Shawn Levy got to them. Finally this summer Wilson and Vaughn are set to once again re-team for The Internship, Levy's follow-up to the family sci-fi flick Real Steel. While the movie is out in June we've yet to see a trailer anywhere (more on that later), but the Russian site Kinopoisk (via The Playlist) has posted a new still for you to enjoy. Check it below and see it full size over at the source. The Internship will be in theaters June 7th and you can find out more about it in our Blend Film Database.